Reflections on Best Baguette in Washington D.C.
Once in awhile, when you put a lot of work into a task and actually get a decent result -- well, you get to gloat, at least for a few minutes. So excuse me while I do so, because my humble, home-made baguettes just topped every bakery in Washington, D.C., in a blind tasting competition. On the one hand, this result was unexpected. I mean, I’m a writer by profession. I’ve always been a writer, well, almost always. But I love to cook too, and at times have become passionate about it. I’m also drawn to crafts, and to crafts people; whether the craft is putting words together or making a whole grain sourdough loaf. But in distinction to writing, baking has been a private endeavor. It was just something I did to break the tension, when my arms tensed up from typing too much, or when I just wanted to leave the computer screen and do something with my hands -- to make something tactile. This grew into a regular practice. Starting many years ago, I stopped buying bread, because I made enough. A few loaves a week, we’d eat one and another would go into the freezer. I became adept at sourdough, using the natural yeast present everywhere. It was like conjuring something out of thin air. My motivation was simple. I just wanted good fresh bread. Who can argue with that? It wasn’t a business. There was no market to worry about, no bosses or rent, nothing. Just baking pure and simple without any distraction because I had absolutely no larger intention. It was pure craft. The parameters of the task were clear and challenging. You have just four ingredients: water, flour, yeast and salt. So often, we think of all the stuff or things we need to do something -- the equipment, the newest gizmo. And I did buy a few things, like bench scrapers and a couche (a linen cloth to support the shape of baguettes) and a baking stone to try and mimic the conditions of a hearth oven. But that was pretty much it, not much more than $100 over, what, a decade? Plus the ingredients, like flour, seeds, walnuts - or whatever else I choose to put in the loaves. Then, there was the baguette itself, which is deceptively simple and hard to master. There’s the soft, slightly sweet crumb, the uneven and slightly chewy and bubbly interior, the crisp crust, delicately toasted in sections, and the aesthetic appearance, which comes from the slashes running down the top of the loaf. When I began baking, this was the first bread I tried to make. It was an absolute failure, too dense, tasting of yeast and lacking a crisp exterior. I tried many times to make it, then just gave up. Decided it couldn’t be done at home. I went on to bake other loaves and over the years learned a lot more. I could have condensed this process had I even taken a few baking classes, but I didn’t. I learned from cookbooks and developed the technique on my own (since baking is more about technique than a recipe -- again the craft of it). But the allure of the perfect baguette was always there, so I’d go back to it now and again, but never approached what I thought even a half decent loaf should be. The breakthrough first came maybe two years ago with a sourdough baguette, which I let rise in the refrigerator overnight. I was somewhat surprised by the results, since I had finally achieved the interior bubbly structure I sought. So for a while I stuck with those loaves, thinking they were pretty close to what I wanted. But then I thought, to really be a baguette, the loaf should be lighter. With the aid of a Peter Reinhart recipe, I made a loaf without any sourdough. It had the bubbly structure, but I felt the taste wasn’t quite on par with sourdough. He also used bread flour, which I felt it was too strong, leaving the interior crumb too chewy, so I switched to all purpose flour -- a misnomer because it really tells you nothing about what you're using. The actual flours I bake with -- King Arthur Unbleached Organic All Purpose Flour or Whole Foods 365 Organic All Purpose Flour -- were ideal because they are both made with hard winter wheat suited to artisan loaves. The final breakthrough came by reading a description of the baguettes made by two of the most influential bakers in France, Eric Kayser and Dominique Saibron, in historian Steven Kaplan’s book Good Bread Is Back: A Contemporary History of French Bread, the Way It Is Made, and the People Who Make It. 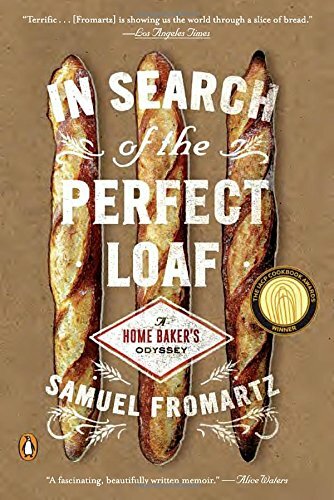 Both bakers added sourdough to their baguettes in minor amounts along with yeast, and though Kaplan’s book is a contemporary historical narrative, he gives just enough information about the technique to craft a recipe. And more importantly, he talks about why bakers apply certain techniques, which can be more valuable than any recipe. Kaplan, by the way, is the world's foremost historian of French bread. Then, in the midst of the recession, I got the unlikely opportunity to travel to France for a new start-up magazine, Afar. They liked my idea of working in a boulangerie -- something I had always dreamed about (and describe more fully in the article which appears this summer). I ended up at boulangerie Arnaud Delmontel in the 9th in Paris working beside Thomas Chardon, a young baker who took me through all the tasks of baguette making. We made a couple of hundred loaves each morning, repeating the techniques so that they become an extension of your body. It was exhausting but highly gratifying, and could be applied to the home kitchen. I also had the great fortune to spend a morning with Prof. Kaplan discussing bread. When I returned, I just redoubled the work and began to get consistent results -- ones I was finally happy with. So why did my baguettes win? In France, my baguettes would have been decent, nothing to write home about especially in comparison to what is available. But because they take a full day to rise, they are also superior to loaves mixed and baked within a couple of hours. And that describes many of the loaves in the DC competition -- approaching the idea of the airy, white, bland bread that also widely swept France but has been roundly rejected by a new generation of artisans. A key insight for me came when Loic Feillet, the baker and owner of Panorama in Alexandria, Va. -- who actually trained with Kayser in France -- mentioned that he offered a true baguette, but his wholesale customers revolted. He could not convince them that his loaf, made with with a hint of sourdough, was superior. So in essence, he dumbed it down to their idea of what a baguette should be. The lowest common denominator may do wonders for a business, but it has never been the path to greatness. Working in my kitchen, I never had to worry about that. My only customer was the ideal loaf that I had tasted on occasion and had in my head. All I had to worry about was to do better next time. So what’s next? A hearty rye perhaps ... it doesn’t matter. The point is to keep my hands moving, connected to my mind and to that ideal of taste I have. To keep the craft alive. 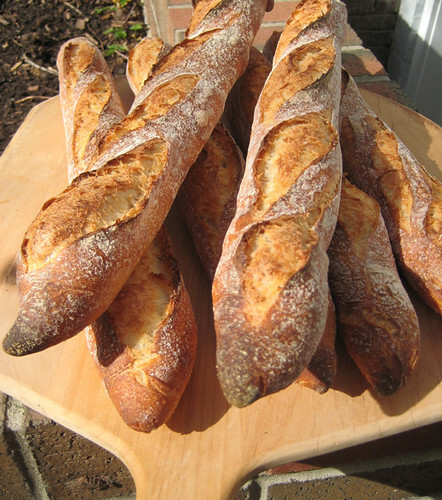 The winning baguette recipe is here. Happy baking!